Are you an expert at using Excel Tabels to Group, filter, and total large lists of data? If so, then you know all the benefits tables can bring to your Excel workbook and how much time they can save you. However, did you know you can name them? For years, I used tables in my spreadsheets — a lot of them — as part of my day-to-day routine. But, I didn't realize that taking a few seconds to give them names could help me keep track of, and keep clear about, which was which when creating formulas. The names become part of formulas you create, so reading a formula to access some information in a table is almost like reading english ... almost. 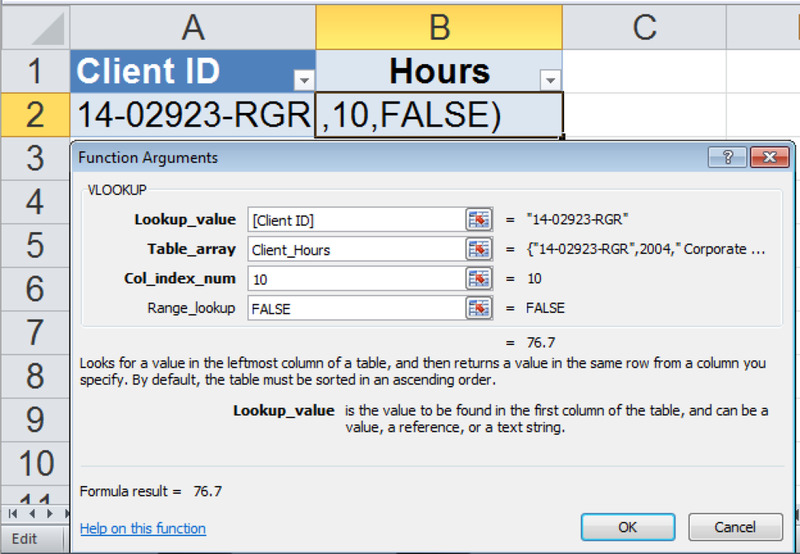 Click anywhere in the body of your Excel table, which will cause the Table Tools ribbon to appear. It contains just a single tab, Design. On the Design tab, in the Table Name box at the far left, see the table name. It's probably something basic like Table1. Type a new name in the box and press Enter. Table names must start with a letter or underscore, they can't contain spaces or special characters, and they can't have names that are already used in Excel elsewhere. For example, you can't use "Sheet 1" if you already have something in your workbook with that name. Now, when you build a formula, you can enter the table name in place of any cell range. In Function Arguments screenshot, $A$1:$0$104 is replaced by Client_Hours.